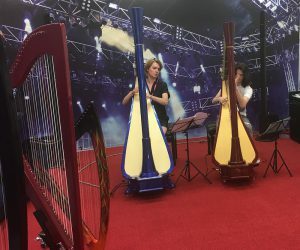 Jazz is one of the most rapidly-developing fields for the harp, but at the time of writing it’s still the case that almost every jazz harpist comes to this music via a classical background. Marcella Carboni has brought out a fantastic new jazz harp method which is particularly helpful if you’re starting like this. “When you start to learn jazz, as with many other types of music there are basically three things you have to learn at the same time”, Marcella explains. “You have to listen to the music, and get a sense of jazz history. Do you know there was a composer called Mozart who wrote ‘Eine Kleine Nachtmusik’ ? Do you also know about Dorothy Ashby, Alice Coltrane, Adele Girard Marsala, Casper Reardon, Robert Maxwell, Ruth Berman-Harris…this background is essential, so I’ve included a historical overview of the harp in jazz. I’ve written about of key musicians, and also provided a chronological discography for essential listening. For example, the first jazz harp solo ever recorded was done by Casper Reardon on Junk Man / Jack Teagarden and his Orchestra (1934). Secondly, you have to practice the scales, chords, progressions, basic theory and of course the standards of jazz. My method takes you through all the basic theory, from major and minor scales to diminished and blues ones, chords on the scales, the circle of fifths, modal jazz, suspended / added / altered / sixth / seventh / ninth / eleventh / thirteenth chords, and so on. I cover how to read lead sheets (compared to classical notation), useful enharmonics, basic voicing, II V I progressions in major and minor keys, improvising on chord progressions, etc. All the theory is followed by over 100 pages of exercises, so that it can become second nature to you on a practical level. Where I can, I try to draw comparisons from the classical repertoire that you’re going to already know. Thirdly, you have to play with other people, otherwise it’s not possible to play jazz. One of the driving forces of jazz has always been the interplay between musicians – a musical interaction where musical ideas are shared and developed in real time. Listening to and playing off one another is a fundamental pillar in any style of music, but in jazz, from Dixieland to free jazz, it is paramount and conditions every performance. At the start of my method, I strongly recommend a combined approach of working on the theory on your own, and playing with others wherever possible. For when it’s not possible, I also recommend where you can get hold of useful backing tracks for practicing standards. This broad approach is very important to me – connecting with other instruments, and particularly with the history and the wider tradition. If the harp is to occupy a serious place in jazz, it must be an instrument alongside other instruments, not a niche on its own. That means it has to be studied as such! In my chronologies I’ve also drawn comparisons between what was happening in jazz harp, and in jazz at large. For example, at the start of the 1950s hard bop developed out of bebop, as evidenced by Horace Silver, John Coltrane, Sonny Rollins, Charles Mingus, Miles Davis, and Thelonious Monk. Meanwhile, on the harp, Betty Glaman was recording with Duke Ellington, Bill Evans, Michel Legrand, the Modern Jazz Quartet and Oscar Pettiford; in 1956 she was the first harpist to cut a jazz record as bandleader, on Swinging on a Harp. I’ve also tried to give a sense of where the challenges lie in particular standards. For example, the structure of all blues is stylistically very easy, but the chords are more difficult. If you’re good at structure and find chords harder, you could go for something more like Donna Lee – the head is hard, but the chords are easy. Jazz Harp: A Practical Method is published by Vanderbilt. European harpists can order it from your harp one stop shop: the Camac e-store!